When Jayme and I first arrived in Alaska in mid June, we were picked at the airport up by Lynne who lives in Anchorage. She was kind enough to drive us to the Eagle Lake Trailhead where we scouted out some routes up a few peaks in the area. I had sights on the Chugach Range before we even landed in Alaska so I had some idea already, but Eagle Peak, Organ Mountain and Flute Peak were the three I was most interested in. We would only get one of the three, but the trip was still a success. We started hiking at 9pm towards Eagle Lake, and because of the very long days, there was still plenty of alpenglow by the time we reached our chosen camp spot near the old cabin at midnight. We stayed on the ridge separating Eagle and Symphony Lakes, and was able to enjoy the alpenglow for hours! The next morning we continued to the upper end of Eagle Lake and hiked east up the flat valley, crossing Eagle Creek numerous times as we tried to avoid bushwhacking. For the most part we were ok but I had to help Jayme get across a couple of the stream crossings as they were roaring! I recalled making a few flying leaps to avoid taking my shoes off and wading (I'm lazy!). I would actually go to great lengths to keep my shoes on. The large waterfall coming down was a cool sight, but not something you wanted to fall into. Once we got to the base of the waterfall, we hiked up the large talus slope to the left of the waterfall and above the first step towards the Flute Glacier. We utilized small game trails for this ascent, which did have a good amount of scree to deal with. Many wildflowers could be seen the entire hike. I loved it! From there we followed the valley as it turned south and went up a second step of only 300 feet, and located a good camp spot in some grass with excellent views of Eagle Peak. We set up camp and took a nice break before continuing on to the Flute Glacier. I think it was about 5pm when we reached the terminus of the glacier, and we decided to keep going, since we had so much daylight. We ascended the gentle snow on the rightmost edge of the glacier and went up the large elevated bench above and west of the main Flute Glacier. This area didn't appear to be an actual glacier so we felt comfortable just hiking up the snow. We eventually reached the north ridge of Mount Ewe and scrambled our way to the summit, which we reached around 8pm or so. Unfortunately some smoke from a new wildfire obscured the really awesome views but we still enjoyed the panoramic Alaskan mountains. I kept wanting to traverse over to Flute Peak but I knew that would take a long time, and it looked technical. I decided against it and we simply retraced our steps back to camp, but when we passed by the end of the Flute Glacier, there was a solo hiker from Anchorage resting on a rock. It turned out he also wanted to do Eagle Peak the next day so I agreed to meet him at his proposed bivy spot early in the morning, and we would climb it together. We followed the south face route described below, and loved every minute of it. Plenty of exposed, difficult scrambling with some snow climbing mixed in. When I returned to camp around 3pm I went right to sleep, and awoke a few ours later to a clap of thunder! Apparently Alaska does get thunderstorms...although it didn't last long. We ended up sleeping the rest of the day and that night and hiked out the next morning back to the trailhead. 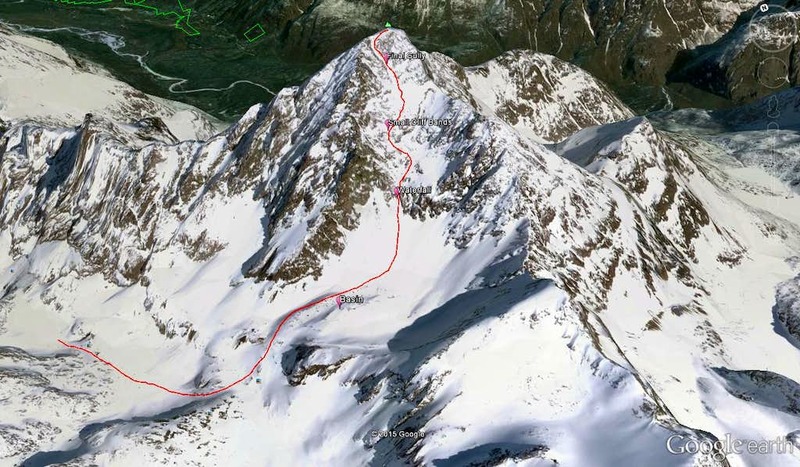 Eagle Peak is a rugged, stout peak located in the Western Chugach Mountains just east of Anchorage. At 6,909 feet in elevation with 1,602 feet of prominence, Eagle Peak is one of the highest peaks in the surrounding area. Nearby Organ Mountain is only slightly higher. 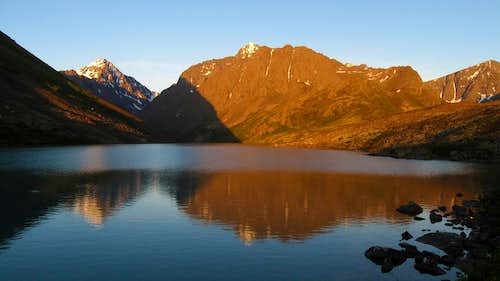 When one hikes the South Fork of the Eagle River, and reaches the large Eagle Lake, this peak towers high above you to the east across the lake. At night in the summer, the deep red glow of the rugged west face stays lit for hours giving photographers a rare dream of experiencing the "3 hour alpenglow". Camping at Eagle Lake is highly recommended to get a chance to experience this divine sight! For those interested in ascending this peak, there is a scramble route that heads up the south face which tops out at Class 3, albeit very loose. It is recommended as a springtime ascent when firm snow covers the loose rock however a summertime ascent is still very doable. Just bring a helmet and don't go in a large party. The views of Cantata, Calliope, Organ, Flute, and Ewe from the summit are breathtaking! From Anchorage: Starting in downtown Anchorage, follow 6th Avenue east as it turns into Alaska Highway 1. Stay on Highway 1 for 11.5 miles and take the Hiland Road/Eagle River Loop exit and veer right. Take an immediate right onto Hiland Road (do not continue on the Eagle River Loop Road). Continue on Hiland Road, as it weaves its way up the South Fork of Eagle River. About 8 miles from the exit, turn right onto S Creek Road and cross the river over on a bridge. The road ends at the trailhead (elevation 1,965 feet) where there is room for about 25 cars. Hike the very nice trail about 4.5 miles to Eagle Lake. The first third of the trail stays well off to the right and above the river to avoid private property, then crosses to the east side on a nice bridge. Just before the lake there is a bridge crossing back to the west side. From here, there is a cairned path marking the best way through the large talus and boulder field. Follow this path around the south side of Eagle Lake. You will pass by an old cabin on the small ridge separating Eagle Lake from Symphony Lake. There are many great places to camp in this area offering incredible views of Eagle Peak, Cantata Peak and both lakes. From Eagle Lake, continue following a faint trail which leads to the upper, east end of the lake. This path stays roughly 100 feet above the lake until reaching a buttress, at which point the trail descends to the lake and reaches the inlet stream. In summer, the remainder of the approach can be annoying for two reasons. You will have to wade across the stream numerous times, and there will be some bushwhacking. It is recommended you cross the inlet stream right as it dumps into the lake and stay on the north side for a little while. You will however be forced to cross back and forth at least twice to avoid awful bushwhacking. Most Alaskans wear old tennis shoes for approaches because it makes wading easy...you just accept the fact your feet will get wet and walk through the streams. We didn't do that and had to take our boots off at least 4 times. You will gain very little elevation on this part of the approach as the valley is wide and flat. Eagle Peak looms above the whole time sending chills down your spine, but you can be assured, you will not be climbing the face you see from the valley, or any part of the approach. The south face doesn't become visible until you are on it! As the valley gets narrower and begins to curve to the right, make sure you cross to the north side of the river before the terrain steepens. Do not try and cross the river too close to the raging waterfall coming down from the upper valley. Even on the driest years this is very dangerous. Once you reach the base of the ~500 foot waterfall (about 2,800 feet), begin hiking steeply up to the left on the talus and scree slopes. A faint path follows a small gully and makes the ascent easier, however it's hard to find from below. Simply head up until you are able to begin traversing right and pass above the cliffs. At around 3,350 feet, you will have ascended high enough to enter the valley above the waterfall. From here, continue about a quarter mile up flat terrain and ascend a 200 foot slope (ie. the second of three steps), passing left of a deeply inset 60 foot waterfall that remains hidden until you can look directly inside the canyon. At the top of this slope there is a couple nice camp spots, however most of the valley at this point is covered with boulders. Jayme makes a long jump! Continue up the once again flat valley for another half mile, at which point you will begin ascending loose talus eastward. At 3,700 feet the ascent really begins. Head east up talus or snow for 900 feet and enter the large basin to the south of Eagle Peak. Take a rest here because the rest of the climb is sustained and steep, loose class 2 and 3. Climb 700 feet up a hideous scree field (hopefully you went in May or June wen it's snow covered) aiming for a waterfall gully coming down from the south face. If this slope is snow covered, an ice axe is mandatory as it is about 40 degrees. Upon reaching the waterfall at 5,250 feet, climb the slabs to the left of the waterfall (Class 3+). This is the crux of the route and it may be wet so be careful. Above the crux, the terrain mellows out for awhile. Just continue up the gully hitting there snow where it lingers. A few hundred feet above the waterfall, scramble up to the left and climb through a few small cliff bands (Class 3). Do not continue off to the right in a NE direction as this gully won't reach the summit due to a large set of cliffs. Once you reach 6,000 feet in elevation, you can traverse back to the right on a large, talus covered slope above the huge cliff band just mentioned. At 6,200 feet you will notice two gullies heading straight up. Be sure to take the right gully and follow it 600 feet up as it weaves left, then back to the right and reaches the upper west ridge at 6,800 feet. Be extra careful in this gully as the rock is very loose (Class 2). Once on the west ridge, turn right (east) and walk easily to the summit. Descend the same way. Great camping can be found at Eagle Lake or at the top of the second step. There is no red tape. Amazingly, this entire mountainous region is a state park!